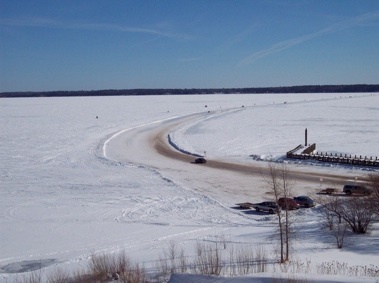 People who visit Madeline Island in the summer often want to know how islanders get to the mainland in the winter after the ferries stop running. Pat and her husband Doug wondered about that too. During the first winter of house construction they learned the answer: the ice road. We were poised at the crest of the hill overlooking Bayfield, ready to plunge into the town below. Spread before us was a vast, uninterrupted vista. To the right of our car, directly beneath us, were the snowy roofs of Bayfield. Thin wisps of smoke, motionless in the still air, extended straight upward from chimneys. To the left in the distance under dusky slate skies was the dark outline of Madeline Island. In between was the flat, frozen plain of Lake Superior. The only thing interrupting the unbroken whiteness was the sinuous road that had been plowed across the snow-covered ice. 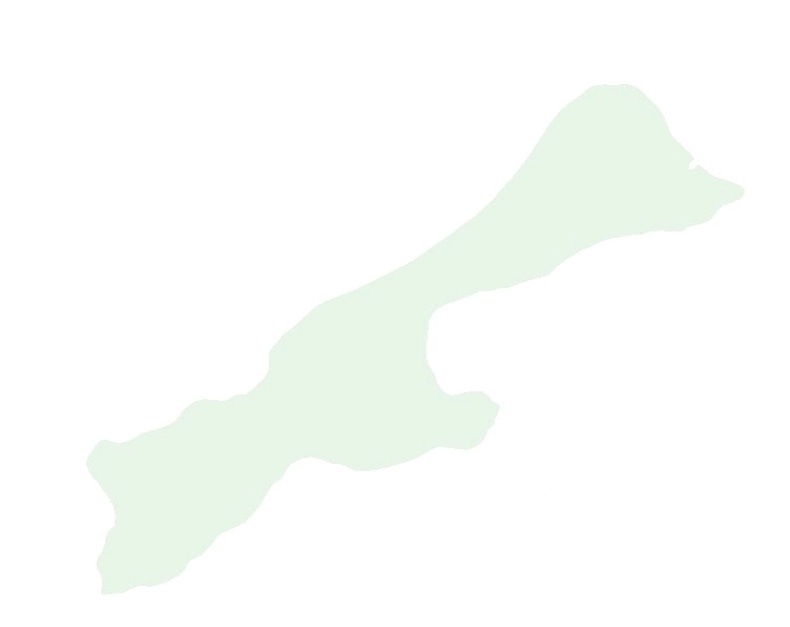 feel a tingle of excitement at the first glimpse of the big lake with Madeline Island snaking long and green across the horizon. But now as I looked at the scene below, waves of fear shot slivers of cold down my back. I felt lightheaded and slightly queasy, as though I was coming down with the flu. But I knew better. I wasn’t getting sick. get there. Ever. The bottom of the hill was where the ice road began. The ice road. 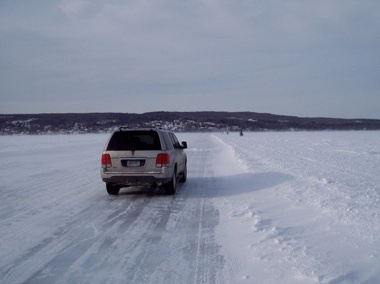 It is the only way to reach Madeline Island from the mainland at this time of year. But I didn’t want to drive across a sheet of ice knowing that Lake Superior was just beneath the frozen crust. I had visions of what could happen to us. I pictured the scene: a clot of people bundled in down parkas peering into a gash in the ice where moments before our car had broken through and plummeted to the bottom of Lake Superior. I longed to be back at home in Golden Valley, safely snuggled under the blue afghan on our living room couch. Or maybe at the Powell’s cabin, the one we had rented for a week in August for so many years. You didn’t have to cross a frozen lake to get to their house. Why were we building a house on an island anyway? How did Doug talk me into such a thing? 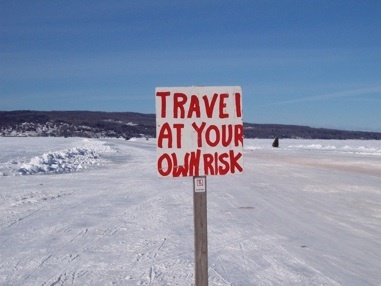 What sense did it make to risk your life to get to a lake cabin in the winter? Was this house going to be worth it? Was any house worth it? 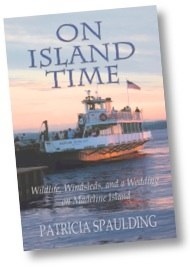 If you want to know whether they made it across the ice road that day, you can read the rest of the chapter in On Island Time.